Over at TNR, Zubin Jelveh puts up this graph of consumer spending and notes that it’s turned up since August. Last month it even crossed above the zero mark, meaning that consumer spending is up a bit from the same period last year. 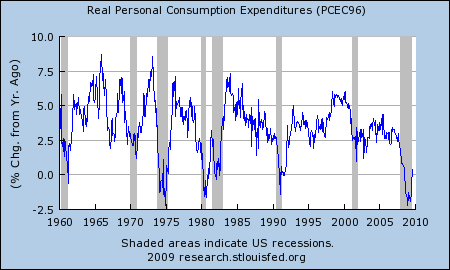 But the great home equity ATM is gone, and that was a big part of what drove increases in consumer spending in previous years as homeowners took out enormous HELOCs to amp up an unsustainable lifestyle. Without that, will we start seeing increases of 3.5% anytime soon? A new study by the Boston Fed’s Daniel Cooper suggests that we shouldn’t be overly concerned with the impact of declining home-equity extraction on spending. Cooper argues that only the credit-constrained (that’s economist shorthand for those with little access to credit) borrowed heavily against their homes to consume. He estimates that an 11% decline in housing wealth in 2008 lead to only a 0.75% fall in non-housing-related spending. In other words, declining home prices could only have a small impact on people’s willingness to spend. The basic reason is that, in a given year, the majority of homeowners are not credit constrained, so a big drop in home prices shouldn’t affect their spending ability (that is, if you believe Cooper and Willem Buiter’s contention that the housing wealth effect is really the housing-as collateral effect). But isn’t the bigger question not the impact of one single factor on spending, but where increased spending is going to come from at all? Basically, it can come from (a) wages going up, (b) increased debt, or (c) spending down savings. Real wages have gone up a bit lately thanks to negative inflation, but that’s strictly a short-term blip. I don’t think anyone expects wages to increase in the future at more than their historical 1-2% rate (1% if you count only cash wages, 2% or so if you count healthcare expenditures too). Increased debt is out of the question too. Consumers are paying down debt, not increasing it. And savings are going up, not down. None of this stuff has to last forever, and eventually all the deleveraging will be over and we can return to fundamental growth rates. But even then, with debt and savings neutral, that growth rate is going to be determined by wage growth. In the near future, at least, it’s hard to see how that gets us back to 3.5%.